Why didn't he do it, eh? Why didn't Sherlock Holmes ever try to apprehend the notorious serial killer, Jack the Ripper? Is it because he was too busy watching this 95-minute movie made in 1965, perhaps? You know. This movie. This one Directed by James Hill; and Starring: John Neville, Donald Houston, with Anthony Quayle. Tut-tut-tut! Bad-boy, Holmes. No Ipad for you. I say, Doctor Watson (Donnald Houston). Do you see that package sent to us today in the mail? That one housing a surgeons’ tool-kit with a royal monogram, embroidered within its lid. Well, let me tell you something very interesting about that item, shall I? That item belongs to none other than Jack the Ripper himself. 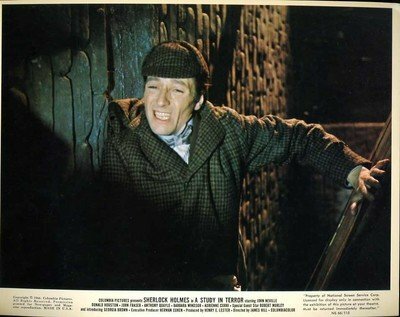 'Sherlock Holmes (John Neville). I'm sorry to say this to you, sir. But I believe that my brother Michael might be Jack the Ripper, because he was tricked into marrying a prostitute named Angela (Adrienne Corri), whilst her pimp, Steiner (Peter Carsten), blackmailed him in the process'. Still. I suppose that's why what next transpires all kicks off, when I'm paid an unsuspected visit by my older brother Mycroft (Robert Morley), just after Doctor Murray (Anthony Quayle) informs me about Jacks next victim. As another killing does occur - the truth ultimately starts a stir - please beware of that damnable stripper - and of course, yours truly, Jack the Ripper. Now in my own humble opinion 'A Study In Terror' only has two things going against it. For a start, it's title is slightly misleading, because this film isn't a psychological thriller about a mad-man's personal plight. And secondly, the Jack the Ripper theory it presents is nothing more than a contrived bit of fiction that is merely associated with this crime by name alone. The facts do not fit. The history is loosely based on ‘Ripper Lore’. And the details within the crimes are sorely lacking. Having said that, though, I have to state for the record that this is one bloody marvelous film!!! Even if ‘Jack all’ in it, isn't about the real ‘Jack the Ripper’. In its own amiable way this is a great murder mystery to sit back and watch. Well, there were a couple of relevant facts scattered throughout this film that does illustrate ‘some’ research has been carried out pertaining to ‘The Whitechapel Murders'. For instance: The public unrest relating to ‘lower class’ living conditions. A fact or two about Jacks victims. A call for the Chief of Police to resign. As well as the infamous ‘Jack the Ripper Letter’ sent to the central news agency. Personally speaking, I found this flick to be a rather refreshing take compared to some of its contemporaries, mainly because it's a mystery first, a Holmes story second, and a Jack the Ripper yarn third. Heck, I'd even go so far as to say that on a conceptual level this is more of a Sherlock Holmes movie than a Jack the Ripper movie. Cause the emphasis is on Holmes figuring out who Jack truly is, rather than why Jack is doing what he is actually doing in the first place. Mind you, that isn't necessity a bad thing within the scheme of things. Particularly when you factor in that Holmes extraordinaire, John Neville, takes the title role by its proverbial horns, and then runs with it all the way to the finishing line, without even highlighting the fact that the mystery he's initially pursuing is relating to Jack, until you're about twenty minutes into this adventure! 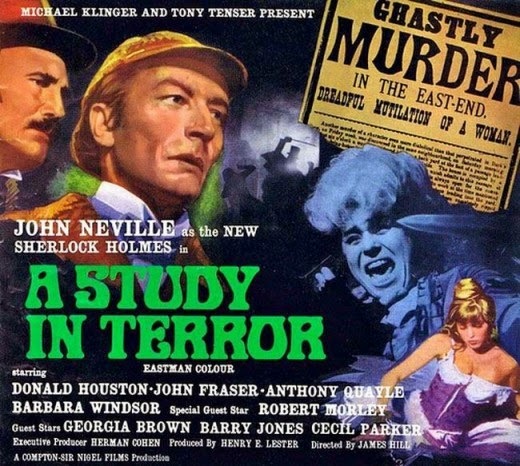 Moreover, there's a lot more to praise about ‘A Study in Terror’ apart from Johns great acting ability. All of the supporting players -- including the likes of Houston, Quayle, and Morley -- are just amazing in it, plus some of the lesser roles too (Psst! 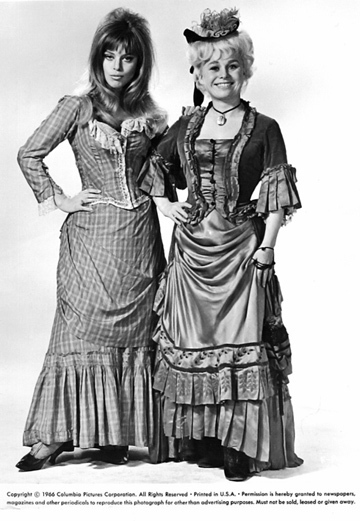 For you Eastenders / Carry-On fans out there, a very young Barbara Windsor plays one of the prostitutes in this classic). And overall this package is enhanced to the nth degree by a very engaging script, some very period looking sets, plus camerawork that appears rather innovative for its time. On the reverse side of this, though, the only downside about this film would have be that certain scenes in it do appear rather rushed in execution, exhuming an almost ‘exposition like’ pace. But apart from that -- nah! -- this is one classy slice of cinema. Here. Look at the facts. (1) 'Columbia Pictures' first released this £160 thousand pound production in England, sometime in October, 1965. (2) Ellery Queen and Paul W. Fairman adapted this film into a novel a year after it was first shown in the cinemas, 1966. 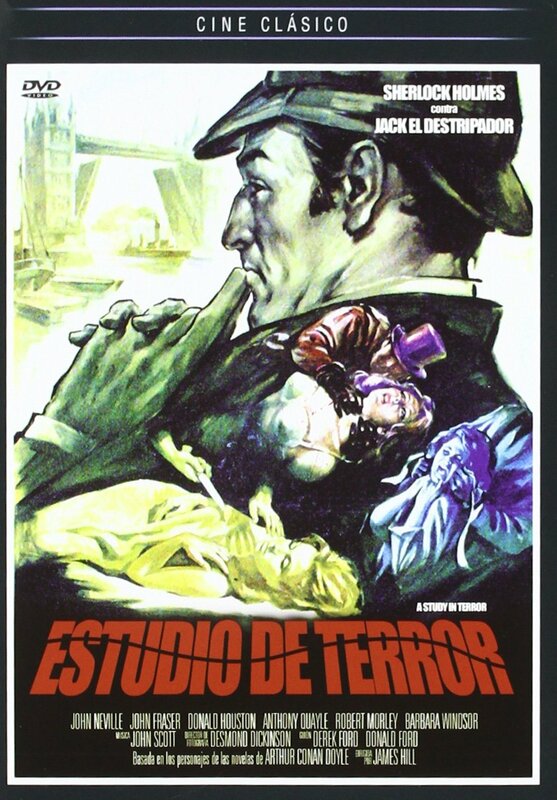 (3) Loosely translated, this project was entitled 'Sherlock Holmes against Jack The Ripper' in France; 'Jack The Ripper' in Finland; and 'Sherlock Holmes Largest Case' in Germany. (4) Although most of this movie was shot in 'Shepperton Studios', Surrey, a scene or two was shot at Osterley Park House, Isleworth, Middlesex. 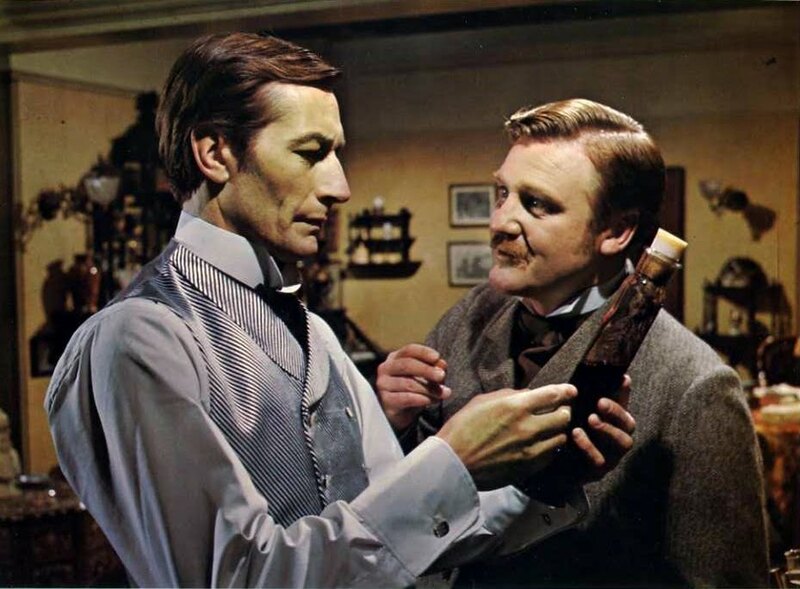 (5) Robert Stephens and Thorley Walters were the first choices to play Sherlock Holmes and Doctor Watson, whilst Jim O'Connolly was originally attached to direct. Yet for some unknown reason they all eventually drifted off of this picture to pastures new. (6) This flick, plus the 'Royal Conspiracy', partially inspired the creation of the 1978 version of Jack verses Holmes, 'Murder by Decree'. Also, on a side note, Frank Finlay and Anthony Quayle were in both films too. (7) The 1892 Sir Arthur Conan Doyle short story, 'The Adventure of the Blue Carbuncle', is alluded to during this films end sequence. 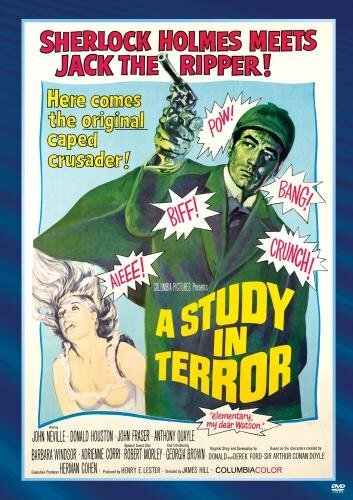 Overall 'A Study in Terror' is a must see movie for people who like Sherlock Holmes mysteries, period dramas, or the ambiance of the Jack the Ripper killings. I would also like to say that it is one of my all time favorite classic period pieces, because this movie has one hell of a zing to it that just won't quit. Don't you agree guys? Hmmm! I take that as a 'yes'. Nuff said.